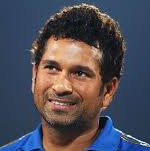 Sachin Ramesh Tendulkar was born on April 24, 1973, in Mumbai. Young Sachin wanted to be a fast bowler. He even undertook trials at the MRF pace foundation, Chennai, but his short stature proved to be a hindrance for bowling. Meeting Mr. R. Achrekar, his Cricket Coach and changing his school to Shardashram Vidya Mandir in Dadar marked a turning point in Sachin's cricket career. Sachin at the age of 16, made his International debut in ODI's India v Pakistan at Gujranwala and Tests debut India v Pakistan at Karachi around 1989/90. He then went to England as a part of the national team, and has not looked back ever since. He knows every shot in the book and and makes his own improvisations. His shots have tremendous power and he times the ball perfectly, making him one of the best batsman in the world. He is also an effective bowler and also one of the best fielders. This all rounder has been the captain of the Indian cricket team twice. 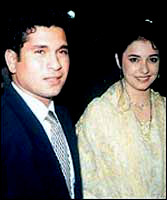 On the personal front, Sachin is god fearing and he is married to a doctor Anjali and they have a two children- Sara and Arjun. In 1998, he won the Coopers and Lybrand Award for 'Player of the year' and has been in the number one position in the Wisden Cricket ratings.